Promising to be Europe’s most exciting fintech trade show, there was a real buzz surrounding Fintech Connect. The team had high hopes and we were not disappointed – Fintech Connect was a fantastic two days and we had a great time meeting other exhibitors and talking to a number of individuals about all things KYC and AML. Day 1 was just as buzzing as day 2. We thoroughly enjoyed our second time at Fintech Connect! With statistics showing that ID theft is on the rise, it is clear that consumers are expecting organisations to enhance their online security. However, how does an organisation do this without jeopardising the customer experience? Additionally, how firms alleviate the potentially high costs associated with such a need? They look for a solution that can be integrated directly into their customer onboarding process – that can verify and authenticate customers all at the same time. We spoke to a number of individuals at the show and there was one key solution that was on their minds – an ID verification solution that would improve the efficiency of their onboarding whilst providing a high level of ID verification. As a leading provider of data quality solutions and ID verification services, the team was able to demonstrate Melissa’s capabilities to a wide range of individuals at Fintech Connect working in sectors such as insurance, marketing, telecommunications and financial services. 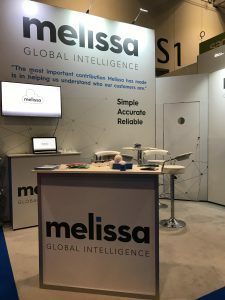 The team was proud to demonstrate the advanced capability of Melissa’s ID verification solution – starting with a basic name to address or date of birth check, all the way to screening and biometrics including facial scanning and documentation authentication. We’re able to provide a confidence score for ID verification so that you have peace of mind when it comes to identifying your customers. We demonstrated our capabilities and were able to share insights into how companies could better meet their KYC and AML needs – for example, we work with a number of money transfer companies to help them better verify the identity of their customers. As we continue to build on our capabilities everyday, we’re certain that we can help all organisations tackle their ID verification challenges! It was also exciting for us to meet with a large number of start ups who were being proactive in the creation of their onboarding process and looking ahead at ways to integrate an advanced ID verification solution in to their onboarding process. Didn’t manage to speak to us? You can email the team on info.uk@melissa.com or call the office on 020 7718 0070. Data Quality? That’s not in my job description!